The #Samsung Galaxy #Note4 is one of the high-end Android smartphones that comes with great battery life. Several tests show that when the 3220mAh battery it uses is fully charged it can provide up to 28 hours of talk time, 10 hours of web browsing, and 17 hours of video playback. Since this device comes with a Quick Charge 2.0 technology, owners can charge this phone to 60 percent capacity in only 30 minutes. There are however instances when the fast charging feature of the device does not work. This is what we will be discussing. In this latest installment of our troubleshooting series we will tackle the Galaxy Note 4 fast charging not working & other related problems. Problem: I just received a new Note 4 (my third one) last week Friday and the fast charger was working pretty fine up until yesterday. In settings the fast charging slot is checked off but when I plug the phone up it is not telling me that fast charger connected. Without the fast charging the phone charges extremely slow! So, can you guys help me solve this problem. Thank You! Solution: When you are charging your phone using the fast charger have you checked the battery percentage your phone is displaying? When a certain percentage level is reached ( usually 75 percent) the phone switches back to normal charging to prevent the battery from being damaged. It’s a different story though if your phone is at 30 percent or 20 percent battery level as your phone should be using the fast charging feature. The basic things to check if the fast charging feature of your phone is not working are the charging port, USB charging cable, quick charger, and the phone software. Let’s start with the phone software as this is the easiest to eliminate. Try to wipe the cache partition of your phone and see if this resolves the issue. If it doesn’t then I suggest you backup your phone data and do a factory reset. If the issue still persists the next thing to do is to check the phone charging port. Make sure that it is clean. If necessary use a can of compressed air or a cotton bud dipped in alcohol to clean the port. Moving forward, try to eliminate any problems that may be caused by the USB charging cord as this easily gets broken. Replace it with another cable and see if your phone fast charges. Finally, another factor that can cause this problem is the quick charger itself. Try using a different charger. 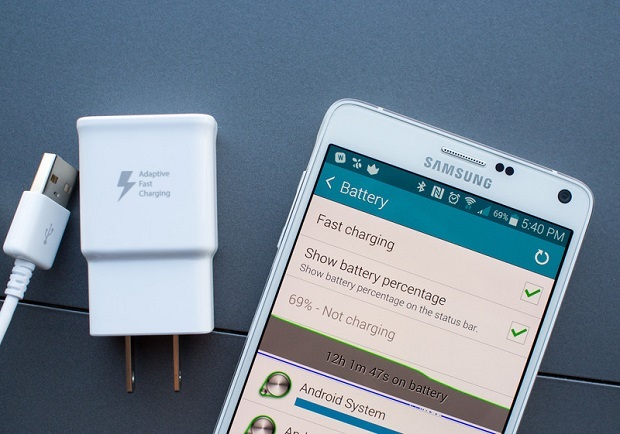 Make sure to use a charger with the Quick Charge 2.0 technology. Problem: After updating to lollipop, i began experiencing charging issues. Despite plugging the long white Samsung fast charger that came with my phone into a wall outlet, my phone says it is connected to usb, and despite having the fast charging box checked it will not fast charge. No power saving is not on, yes i have factory reseted and lost all my data and still the phone battery drains while i use it while charging. Solution: Since you have already eliminated any possible software related issues that may be causing this problem it’s time to concentrate on your phone hardware. Try to check the charging port of your phone for any signs of dirt or debris. Presence of this foreign matter may interfere with the fast charging feature of your phone. If necessary clean the charging port using a can of compressed air or cotton bud dipped in alcohol. The next thing you need to look at is the USB charging cord. This cord easily gets broken especially if it is constantly coiled and bent. Get a new USB charging cord and see if this resolves the problem. The last thing that you should look at is the wall charger. This charger comes with a special technology which allows your phone to charge quickly. Try using another fast charger (make sure it comes with the Quick Charge 2.0 technology). Problem: I left my phone charging during the night as always but today when I got up I saw the battery percentage to be only 80% and not charging. I unplugged it and plugged it again (the USB cable to the phone) and the charging symbol appears only for a couple of seconds and then disappears and doesn’t charge. I have tried removing the battery and plugging it without it(no response), soft reseting it (pressing the power button without the battery for 30 seconds) and nothing has changed… I will try with another cable and plug but in the meantime I wanted to send you this message just to speed things a little bit up. Kind Regards. Solution: This appears to be a problem concerning the USB charging cable. Try using another USB charging cable and see if your phone charges. If it doesn’t then check your phone charging port for any signs of dirt or debris. Clean it if necessary using a can of compressed air or cotton bud dipped in alcohol. You should also consider using a different wall charger if the issue persists. Sometimes your phone software can also cause this type of problem. If this is the case then try wiping the cache partition of your phone then check if your phone can now charge. If your phone does not charge then I suggest you backup your phone data then do a factory reset. Problem: Even though my phone says it has 15%, my phone completely turns off and when I try to turn my phone back on,it does not turn on. So I connect my phone to my charger and it says 0%. This happens all the time. This also happens in ultra battery saving mode. What should I do? Solution: It looks like your phone battery is already weak. I suggest you get a new one and see if this resolves the problem. Before getting a new battery though I suggest you backup your phone data then do a factory reset to eliminate any possibility of the phone software causing this problem. Problem: I have a crackling sound when I use my tablet,when I tap an app like my games and when I check.my email the page is sometimes blank but you can see parts of letters on edges.It sometimes takes to long to charge and drains fast. ANY IDEAS ,IT’S ONLY 6 MONTHS OLD. Solution: Try to eliminate the possibility that your phone software is causing the problem by backing up your phone data then doing a factory reset using the hardware keys. After the reset do not install any apps or update your phone. Check first if the issue still occurs. If you still hear a crackling sound then this may already be a hardware related problem. I suggest you bring your phone to an authorized service center and have it checked. Problem: After about 75 % the charges really slow. I power it off take out the battery put it back in power it on and the battery says 100% plz help asap. Solution: The Note 4 will switch to normal charging mode from fast charging once a certain battery level percentage has been reached (usually at 75 percent). This is to make sure your battery is protected from damage. However, if it takes a long time for your phone to charge to 100 percent then the problem could be software related. I suggest you wipe the cache partition of your phone first and see if this resolves the issue. If the problem persists then backup your phone data and do a factory reset. can i use redmi and vivo phone charger to charge my galaxy note 4? if i use redmi and vivo charger will my galaxy note 4 get a problem in long way. so plz suggest me what will i do. I don’ t have my orginal charger of galaxy note 4.
had to turn off my note 4 in order to charge other wise it wont charge and it drained what’s left on the battery while charging even though the phone is off. replaced charger and battery even though adaptive fast charger is enabled but phone won’t recognized. 4. If your phone says “charging” only..which was case for my phone.. i had given a try by connecting phone in office and it was working fine. That means it was neither phone nor charger..But electrical supply at my home. U can try this once. I just talked to Samsung support about my issues, and I found out that by starting the Note 4 in safe mode (power on but hold volume down button until fully booted), fast charging worked fine. As soon as I turn safe mode off, all the apps run, and fast charging turns off. So I have 55 apps to trawl through to find the culprit, but I will report back when I find it. Fast Charger doesn’t works on Note 4. Hey.. so something funny is happening with the fast charger, and like others this is all after the latest update. So if im on power saving mode it wont fast charge ( which it used to before ) but soon as i switch off power saving mode the fast charger works. this is quite annoying. also , is anyone facing issues with their headset ? where when i connect the headset, but if i get a call while playing music it goes to the speaker after i end the call? and then it will play through the headset only after a restart . And similar issues with a bluetooth headset, first i thougth it was the headset or bluetooth software, tried most resets but it doesnt help. I’m intrigued by this whole issue. Twice I have done the wipe cache partition , done a soft reset and bought a brand new fast charger unit with cable. There is no change to the issues with trying to charge the Galaxy Note4 with the new equipment. Yet I can have the phone attached to my notebook and it will slowly charge to 100% charge. So what is going on? the port can not be the problem otherwise the phone would not charge on the computer ( despite the fact that this needs to be connected possibly overnight).. Like others it seems that the moment the phone upgraded to 5.1.1 this issue began. Will upgrade to 6 ( Marshmallow) fix this? It seems to me that there has to be an issue ( bug) in the Lollipop update. So what’s the answer?